What happens when a motley crew of women writers and illustrators from Australia and India come together to write a book, without actually meeting? Over a year ago, 20 artists and writers connected virtually, over copious emails and Skype sessions, to talk about the challenges of being a woman and to speculate on the endless possibilities. The result is Eat The Sky, Drink The Ocean, an anthology of speculative fiction stories for young adults. Published by Young Zubaan, the book has been edited by Payal Dhar and Anita Roy from India, and Kirsty Murray from Australia. In the introduction, the editors explain that the idea stemmed from the storm that gathered in response to the violent crimes against women in Australia and India in 2012. They decided on the title, Eat The Sky, Drink The Ocean, because it suggested impossibilities, dreams, ambitions and a connection to something larger than humanity alone. They add that all the stories embrace the idea of not just eating pie but of taking big, hungry mouthfuls of life and embracing the world. The book offers utopian realms that reflect alternate realities for girls and women. 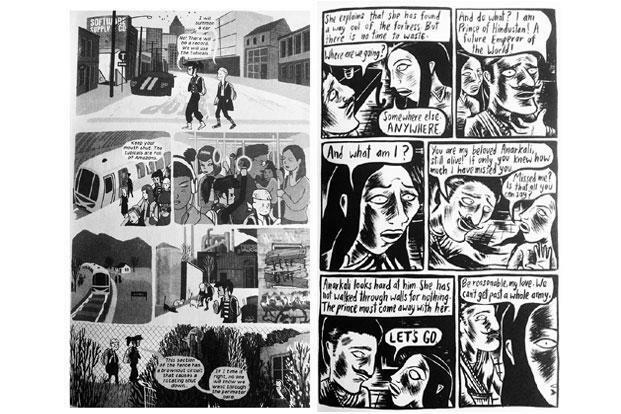 The stories—which take the form of black and white graphic tales, twisted fables, and a play—take on issues such as patriarchy, gender equality, molestation, body image and misogyny. As the emails flew thick and fast, the story ideas took shape. Samhita Arni and Alyssa Brugman had a conversation about feminism and cultural differences and found themselves drawn to the way “capitalism and consumerism had co-opted the feminist movement”. Both writers explore the rigid conditions and expectations set for women: Arni writes about a community where girls are banned from being magicians, at the same time exploring female infanticide; Brugman narrates the story of a woman who trades a kidney for perfect hair (like broad hips, hair is also a sign of a woman’s “good breed”). Fables also get reinterpreted and twisted. In Little Red Suit, Australian-American writer Justine Larbalestier retells Red Riding Hood. Poppy leaves a drought-ridden Sydney to check on her grandma, and finds herself being stalked. Anarkali by Annie Zaidi and Mandy Ord is a fantastic graphic retelling of the story of the court dancer being entombed alive on the orders of Mughal emperor Akbar. However, instead of pining for her lover, Prince Salim, Anarkali takes matters into her own hands. Eat The Sky merges contemporary issues with sci-fi. In Cooking Time, Roy tosses together reality cooking shows with time travel to present a future where real food has been replaced by the artificial Newtri, which is luckily available in 70 great flavours. It’s eerily reminiscent of genetically engineered food and products like Soylent, a drink that the makers say is “designed for use as a staple meal by all adults… (and) provides maximum nutrition with minimum effort”. The tapestry of Eat The Sky is essentially feminist, but it weaves in issues of food security, environmental destruction, class barriers, social justice, consumerism and human rights to create lustrous narratives. In our patriarchy-dominated country, the anthology stands out for its plucky writing and bold imagery.